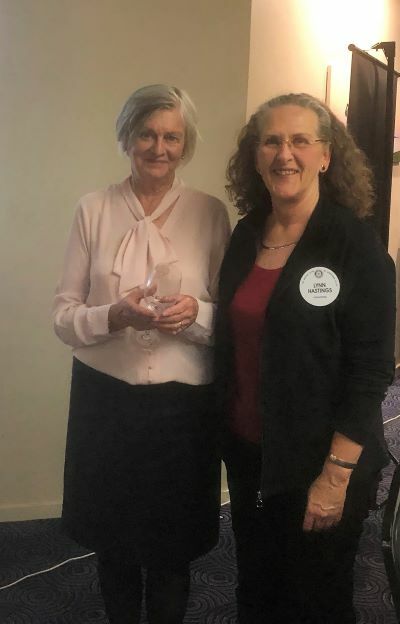 Narooma Rotary Beacon 22 November 2018 – Narooma Rotary Club Inc.
Seventeen Rotarians and guests were at last week’s meeting. Both President Rod and Vice President Laurelle were in Sydney so Bob Aston was in the chair. Guests were our regular Iris and our guest speaker and Geoff’s wife Dr Eleanor Robin. Lynn Hastings thanks Eleanor for her engaging presentation. Eleanor recently wrote a biography of Captain Charles Swanston called Swanston – Merchant Statesman, launched in Hobart in August. Swanston settled in Hobart in 1829 and was a colourful and fascinating character, becoming one of the most influential men of the time in Hobart Town. He played a key role in setting up the Derwent Bank and under his leadership attracted a large amount of overseas capital. He was also a member of the Tasmanian Legislative Council. Swanston also played a significant role in the development of the Port Phillip District, hence the naming of Swanston Street in Melbourne in recognition of his achievements. A large part of Eleanor’s talk was about her research and how she tracked down primary resource material . It was interesting to see photographs of some of those documents. Saturday dawned looking overcast and stormy, fortunately the skies cleared in time for us to set up outside Betta to serve sausage sandwiches to the hordes turning up to help celebrate the store’s first birthday in the industrial estate. Numbers were steady and there was lots of debate about onion on the top or underneath the sausage, but a good time was had by all. It also gave us a chance to again promote Rotary in our community. Thanks to Liz and Julian Barrington-Smith and their team for purchasing the sausages and bread to sell and for giving us the opportunity to promote Rotary. Thanks also to Chris O’Brien, Ange Ulrichsen, John Rungen, Mal Gray, Peter Bull, Julie Hartley, Bob Aston, Iris and Frank Eden for helping out on the day. Julian and Liz were most appreciative. Julian and Liz saw a business opportunity when they moved to Narooma. They believed in Narooma’s regional potential and are now making their vision a reality. They have greatly increased their staff, increased their product range and greatly increased their turnover. They really appreciate the community support they have received. THIS WEEK IS A PARTNERS’ NIGHT with guestspeaker Past Rotary International Director Noel Trevaskis. Noel will talk about ‘The Rotary Story; Yours and Mine’. Noel is currently a member of Narooma’s ‘mother club’, the Rotary Club of Bega. He has had extraordinary Rotary experience being on the Board of Rotary International (2016-2018) representing Australia, New Zealand, Philippines, Indonesia and the South Pacific Islands (Zones 7 and 8). Noel was our District Governor 2005-2006, and a past Board member and Chairman of Australian Rotary Health. His own personal story too is extraordinary. Our BowelCare coordinator John Rungen has received a report on the results of the 2018 BowelCare campaign across Rotary Districts 9710, 9685 and 9670. It highlights why we participate and why we should continue to do so. Sales were down on previous years, mainly due to the National Bowel Cancer Screening Programme increasing their eligible age brackets for the free screening kit.Those 75 and over are not eligible for the free kit. Only 85.5% of people who purchased the kit completed the test. More women than men did the test (59% c.f. 41%) except in the under 40 age bracket. A Local Drug Action Team (LDAT) has been formed with 12 local organisations looking to tackle the drugs problem in the Shire. This is a follow on from the successful Drugs Meeting in Moruya in April, a combined Rotary clubs initiative which attracted over 200 people to discuss local drug and alcohol problems. MoruyaRotary (and presumably the Shire’s Rotary Clubs?) is represented by Robert Richmond. He will be providing advice on how Moruya Rotary might be able to support this practical follow up to PP Mike Dent’s Drugs Meeting initiative. 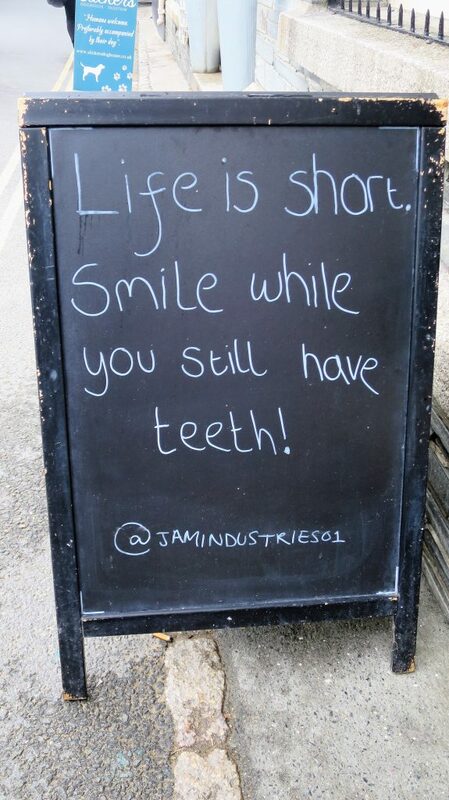 Spotted by Laurelle in Padstow in Cornwall during her recent travels. More signs to come, courtesy Peter Bull.